﻿ Caroline Sutherland is a nutritional consultant, medical intuitive, author, teacher, and innovative leader in the fields of nutrition and energy medicine. Caroline Sutherland is a nutritional consultant, medical intuitive, author, teacher, and innovative leader in the fields of nutrition and energy medicine. She’s the popular Hay House author of The Body Knows book series. Caroline has a vast clinical background as an allergy-testing technician in Environmental Medicine where her intuitive gift developed. In the early 1980’s while working as a physician’s assistant she began to receive intuitive impressions about the patients, an experience which groomed her to become one of the most sought-after medical intuitives today. Caroline was raised in a medical family – both her father and grandfather were medical doctors. As a child the “blueprint” of her family lineage created important seeds for her future career as a medical intuitive. For over 36 years, she has lectured internationally on the subject of health education and medical intuition, and her intuitive impressions have positively affected the lives of thousands of people. “I’ve been a Caroline Sutherland fan ever since the first moment I met her in the ’90s. In fact, she fulfilled a dream of mine. At our first meeting, Caroline looked at me, clearly saw my deficiencies and nutritional needs, and on the spot designed a special plan for my particular body. I felt understood for the first time." Please note: Caroline does not do consultations for people who are dealing with complicated health issues or who are on an array of prescription medications. If you have health challenges, please consult with your physician. 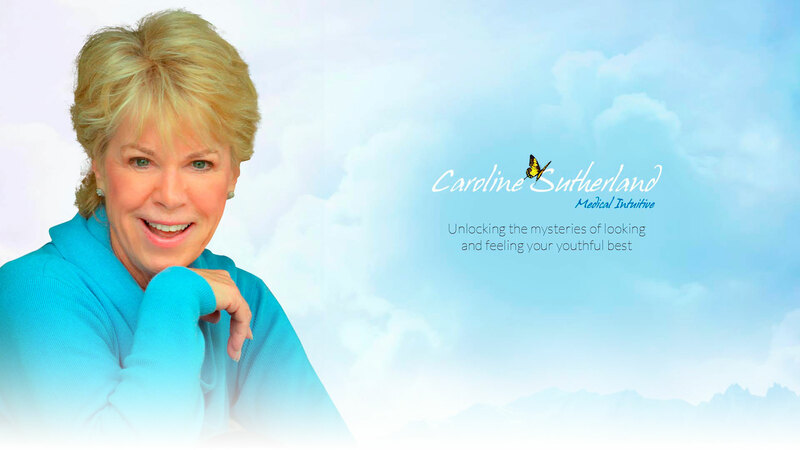 Imagine a personal reading and assessment from internationally renowned Medical Intuitive, Caroline Sutherland. Caroline has created a unique, confidential, and effective format designed to aid people with their health concerns in an exciting one on one telephone consultation. During these enlightening sessions, Caroline offers individual assistance, including her in-depth explanation of her intuitive impressions with targeted health guidelines to achieve your health goals. The information that Caroline offers is oriented to correction or what might be useful to bring your body back into balance in terms of diet, supplements, botanicals, homeopathy, environment, and lifestyle. After the initial reading, Caroline will schedule two important follow-up sessions. Medical Intuition Wellness Lectures - 2-CD set: Listen to this pertinent information to prepare for your consultation with Caroline – Downloadable Mp3. As an additional option, Caroline offers a half hour mini-reading for $199. This affordable, fast-paced, practical mini-reading will include an overview of your health issues and specific guidelines to get you on track with your health goals. The mini-reading is recorded but does not include follow up. “Foolproof, rock solid advice delivered in a bold, confident organized way. A lot of information was jam-packed into the session. Very worthwhile." "Caroline is a super pro when it comes to conducting consultations and classes - a real keeper!! Thank you." "I am so thankful my friend Patty for telling me about Caroline. Talk about having "aha" moment! Very informative." "Caroline blew me away. She was wonderful. Precise, take control kind of gal. Great info." "Caroline is a well-seasoned professional. Genuinely interested in helping people, she is authoritative with her delivery. I am a holistic healer & I find her delightful and inspiring." "Caroline is brilliant. I love learning anything about food, nutrition, health remedies, and hormone balancing from her. I am a big fan and she improved my health with her assessment 10 years ago. I love Caroline!" © Sutherland Communications, Inc. All Rights Reserved.